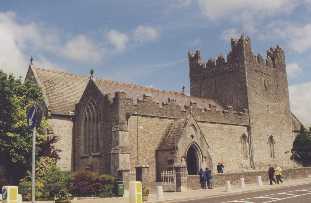 The present Catholic Church in Adare was once the Trinitarian Abbey, which was founded in 1230. It was restored in the 19th century, in 1811 and 1852. According to Westropp the alleged date of construction of the Trinitarian abbey was 1230. However, Spellissy and O'Brien believe that the abbey may have been in existence as early as 1226. The monastery flourished until the dissolution, when, with the other religious houses subsequently founded here, it was granted by Elizabeth I to Sir Henry Wallop. The Trinitarian Order was founded on the continent in the late 12th century (in 1198) during the pontificate of Pope Innocent III. The order was founded by St John de Matha and St. Felix de Valois, the latter being a grandson of the King of France. The main function of the Order aside from its religious purposes was the ransoming and liberation of Christian captives during the wars of the Crusades. This monastery was commonly called the White Monastery. The habit of the order was white with a shoulder cross (greek cross) with the horizontal bar being blue and the vertical bar being red (it overlapped the blue). This was on the front of the scapular of the Habit and on the shoulder of the cape. After its suppression at the time of the Reformation it gradually fell into ruin. The remains of the monastery consist of tower, nave, and part of the choir of the church. 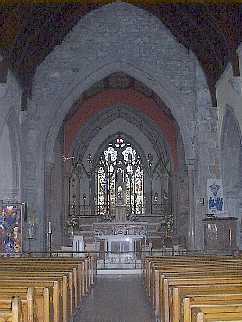 In 1811, the Earl of Dunraven converted these remains into the present day Catholic parish church. The original foundation consisted of a nave and chancel with a north and perhaps south transept, the ambulatory of cloisters, conventual buildings and columbarium. The massive battlement tower was a later edition in the 15th century. It gives the impression of having been built for defence rather than for a religious purpose. The dimensions of the tower are 34' from north to south 31' east to west, and 67' high. The roof of the restored building is higher than the original roof of the abbey. There is a door in the north west pier about 12' above floor level. Inside the door a winding stone stairs leads to the belfry and the top of the tower. At the restoration in the 19th century care was taken to preserve the two piscinas, one in the nave, the other in the chancel of the original church. In them the sacred vessels were purified after the celebration of Mass and distribution of Holy Communion. To the back of the Trinitarian abbey is a dovecote, or columbarium. 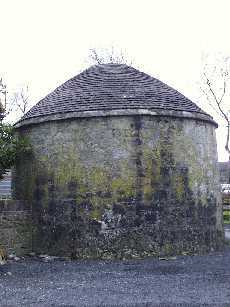 It is a circular building in which doves and pigeons were housed. There are no windows in the structure but there is an opening in the roof through which the birds could come or go as they please. The internal walls are lined niches where the doves rested and where their food was provided. A door at ground level was the entrance for the monks. The baptistery is located at the back of the church on the right hand side. The baptistery railings were donated in memory of Mr John Walsh in memory of his wife. 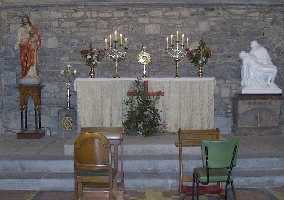 A picture beside the altar depicts religious symbols. Miss Sarah Clifford of Thomastown, Effin donated the seats in the side aisle, in memory of her brother William Clifford, a doctor in Adare for 38 years, who died on May 31st 1923. According to local historian, Noel Hogan, Dr Clifford lived in a two storey thatched cottage in Adare village. Dr Clifford's son Michael died on 30th June 1922, aged 6 and a half. As a mark of appreciation and respect for Dr Clifford's long service to the community of Adare, his son was buried in the grounds to the front of the Trinitarian Abbey. Dr Clifford, himself, was buried beside his son on his death eleven months later. Also buried here are Helen Clifford of Crean House Bruff, who died April 30th 1980, age 59, and her husband William, who died August 16th 1989, age 70. The stained glass windows on the right hand side of the church depict Mary adoring God, the Prodigal Son with an angel, Duras and the rich man. They also show scenes from Jesus' life, including his Baptism, Mary of Magdalene, receiving the sacrament of penance, clearing the temple, and the raising of Lazarus from the dead. There are also statues of the St Joseph and the Immaculate Conception. There are also stained glass windows depicting the Apostles asleep in the garden, and Christ the King of the World. 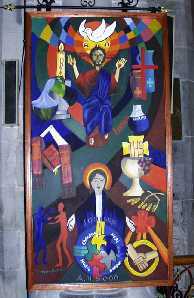 A stained glass window depicting the birth of Jesus was donated in memory of John Downey who died November 9th 1857, aged 72. Statues depicting the Sacred Heart and the Pieta are on either side of the altar on the right hand side of the church. There is also a plaque to Edwin, the third Earl of Dunraven, who restored the church and contributed to local education. 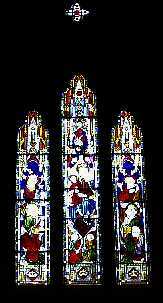 The east window is to his memory, and depicts the Three Wise Men and the Infant Jesus. In the east window of the present church, there is a panel depicting a captive holding broken chains in his hands, and nearby a cleric offering a pouch of gold - the ransom money, a clear symbol of their office. This symbolises the link between the church and its founders the Trinitarians, who were set up to free the Christian captives during the Crusades. There is a statue of St Theresa to the left of the altar at the top of the church, directly under the main stained glass window. There is a statue of an angel on either side of this altar. There is also a statue to St Joseph, and a shrine to the Immaculate Conception. The main stained glass window bears an inscription that reads "Going therefore teach ye all nations baptising them in the name of the Father and of the Son and of the Holy Ghost. He commanded us to preach to the people 'he that believeth and is baptised shall be saved'." 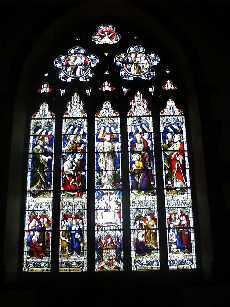 The window depicts Jesus sending out the eleven apostles. The Dunraven Family Crest is also depicted on the window. 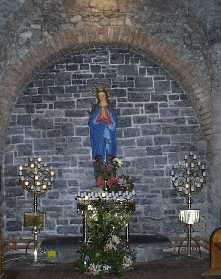 On the south wall, the window of the Coronation of Our Lady was designed and executed by the Irish Stained Glass Co., Hanover Quay, Dublin and was installed for the feast of the Immaculate Conception on the 5th December, 1980. In the main body of the church, there is a plaque to Edwin, the third Earl of Dunraven, who died on the 6th of October 1871. 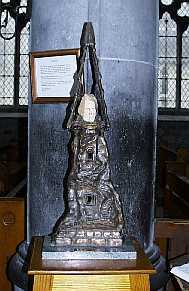 A modern bronze sculpture in the church, titled 'The Way', is dedicated to the Holy Trinity Church. It was designed by John Blakeley, and depicts the hill in Jerusalem. The centrepiece of the sculpture is a 5 million year old piece of marble from Jerusalem. According to Fr Moriarty, there is a local tradition that, prior to its restoration for Catholic worship by the first Earl of Dunraven in 1811, there was a movement afoot to continue the ruined monastery as a market house. One day as the Earl was passing by he stopped for a few minutes gazing at the ruins. As he moved away he was heard to remark "I never will allow it to be a den of thieves." He proceeded to restore the ruins as a parish church. In a window in the south wall of the church there is a panel depicting Our Lord driving the sellers out of the temple and underneath are the words from St Luke's gospel Ch. 19. V. 46. "My house is a house of prayer, but you have made it a den of thieves." The Stations of the Cross were received from Meyers of Munich by the then Parish Priest, Very. Rev. John Stanislaus Flanagan in 1884. Of the sacred vessels used in the church the most valuable is the "Thaddaeus Quin" Chalice. The inscription reads "Ex dono Thaidi Quin Armigeri de Adare in perpetuum usum Parochial Sancti Nicholai de Adare anno dni 1726." The chalice has an everted rim and a calyx elaborately chased with renaissance ornament. The church was repaired and enlarged in 1852 by Edwin Richard the 3rd Earl of Dunraven famous antiquarian and historian, who was a Catholic. He had the nave lengthened by 12 feet, the porch erected, and the Lady Chapel built, at the east end. This enlargement was carried out under the direction of Mr Hardwick, the celebrated English architect. One of the features of this enlargement is a bronze screen designed by Pugin, which separates the Lady Chapel from the Sanctuary. It was the gift of Windham, Thomas 4th Earl of Dunraven in 1884. According to a plaque on the right hand side of the church, George Alfred and his team of workers restored the Holy Trinity abbey from July 1977 to December 1980 by the generosity of parishioners. By 1978, most of the stone had been revealed and in the main was in excellent condition. In sections the original brick was removed and replaced with similar stone. One particularly poor section was at the window near the entrance, where the present shrine to Our Blessed Lady is. The back wall of this section had to be replaced to allow the erection of the shrine. During the restoration work, on Sunday June 10th, 1979, the first ordinations in 450 years took place in the church, a unique and historic occasion for the people of Adare, emphasised by the fact that one of the priests ordained was from the parish, Fr Joseph Shire, of Drehidtrasna.